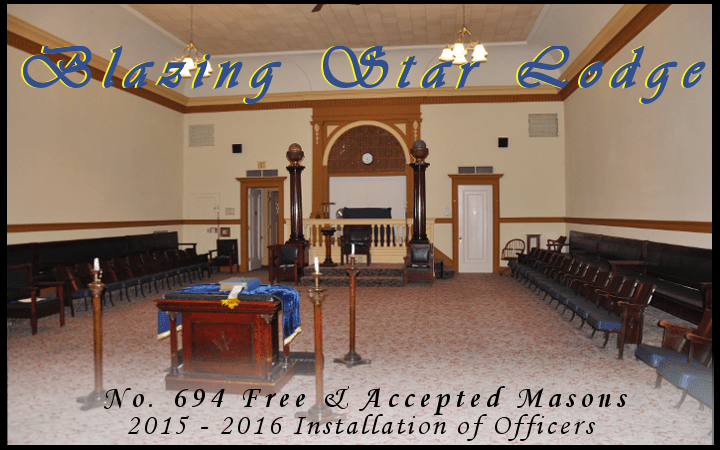 Our next communication this Tuesday 5/26 will bethe installation of officers for 2015-2016. Please show your support for our incoming Master, Bro JimAndruczyk and the entire line of officers. These new officers havemade a commitment to guide our great lodge into the future and it is up to all of us to show appreciation for the commitment they have made. This is a public installation so wives, girlfriends and guests (especially prospective brothers) are welcome. If you plan to bring someone for dinner, let myself or W:. Russ know so dinnercan be plannedaccordingly. Hope to see you there.Officers in tuxedos if you have them. If not, normal lodge attire. Here is a list of Blazing Star Officers for the ensuing year.